This week's parshah is Acharei-Kedoshim, which is chock full of mitzvoth. When it comes to the commandments, there are huge discussions to be had about the laws from the Torah versus mitzvoth from the Rabbis, as well as the "fences" that the ultra-Orthodox build around the basic halachot (laws). As a seminary student in Israel, my wife and her friends had to cook their own meals. 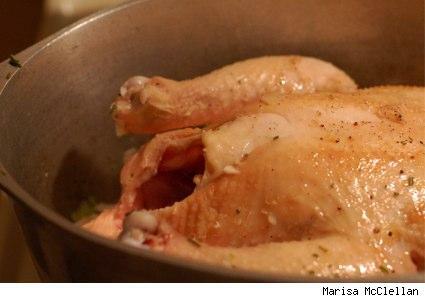 One evening, as my wife was about to broil a chicken, a roommate stopped her, horrified at what was happening. "Don't you know that you can't cook a chicken whole, that you must remove the legs first?" her friend exclaimed. My wife had never heard of such a thing, and neither had the few rabbis they spoke with about it the next day. So the roommate asked her mother why she cooked chicken that way. Her mother said that she had copied her own mother who was fastidious in the observance of kashrut laws. So they asked the grandmother: "Why did you always cut the legs off the chicken?" "Simple," she explained, "There wasn't enough room in the pan!" Then again, when it comes to fences, as Vayikra 18:30 says, "guard my guardings" (וּשְׁמַרְתֶּם אֶת מִשְׁמַרְתִּי) ... which suggests, perhaps, HaShem wanted us to put up some fences. The question is: How many? How big are those fences? Also: Every time I go to someone's house for the first time and observe their own minhagim (tradition) quirks, I wonder and ask where they came from. Often times, people don't know. It makes me wonder how easy it would be for me to simply create a tradition, to build a fence around a mitzvah and make it standard. Oh the options!